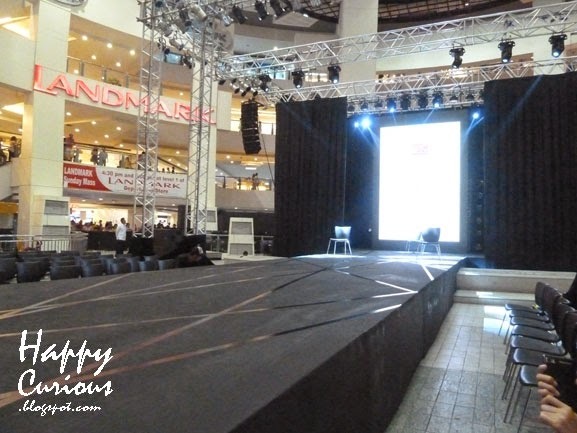 It was my first time to go to a fashion show, and a man's fashion show at that so I was quite excited to go. I had invited along 2 of my gal pals but I ended up going alone. Nevertheless, I enjoyed myself because I met new friends and enjoyed the show. 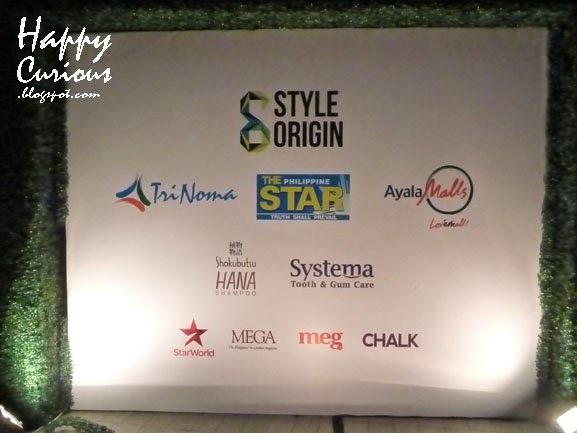 Style Origin is an annual Ayala Malls lifestyle project launched in Greenbelt last May and is currently making its way through 12 premier Ayala Malls destinations. Me and some bloggers came early so we still had some time to chat and take photographs. This show presents Mensweek, directed by Ariel Lozada and showcases 33 of the country's top designers, namely Gian Romano, Ivar Aseron, M Baretto, Joey Samson, Don Sevilla, Renan Pacson, Rhett Eala, Jerome Lorico Jeff Rogador, Anthony Ramirez, Avel Bacudio, Bang Pineda, Chris Diaz, Dennis Lustico, Herbert Custodio, Jaggy Marquez, Noel Crisostomo, Norman Noriega, Proudrace, Regine Dulay, Roland Alzate, Sassa Jimenez, Tonichi Nocom, Ulysses King, Willar Matteo, Y. Quisombing and Ziggy Savella. That's quite a lot of names in fashion and style so I expected quite a lot of varying styles and I was not disappointed. In fact, I was quite surprised by some of the styles. I never expected men's fashion to incorporate women's clothing concepts in their most original implementation - like wearing a skirt as a skirt instead of appropriating it for utilitarian purposes which is usually how some feminine styles are repurposed for men's wear. The show started off with an introductory presentation where some models were on stage making a tableau with chairs as their props. And the show ended quiet satisfactorily, I might say. I've always thought of men's fashion as just simple and straightforward but now it seems that the concept of men's wear has expanded to include concepts from women's fashion without making it more appropriate for guys. I wasn't able to take a picture of all the clothes on the ramp but some of the surprising and interesting styles I saw included the comeback of shorts that are actually above the knees; capri's are now part of men's wear options; leggings on men - and I mean in casual wear, not sports wear and of course, the skirt but at least a full skirt. I think my jaw would have dropped to the floor if someone appeared with a mini-skirt on but thankfully, even with the skirt, everything remained manly throughout the show. This show was quite opening for me and for some of the men too I would hope. Our new crop of designers are coming up with bold and modern ways to update men's wear and expand the concept of what men can wear at the same time. It would be interesting to see what concepts from these new styles will be adopted by customers and embrace as their own. Maybe we can look forward to guys having the same problem as girls of having too many wardrobe choices and spending more time choosing too.